Banana Cream Cheese Muffins – The sweetest and creamiest muffin recipe ever. It’s like eating banana muffin and cheesecake together in one bite! Tomorrow is Halloween and I’m sure everyone is busy and gearing up for trick or treat. Baby G is celebrating his first Halloween this year, well, I mean he is actually going to dress up this year. The last two years, he was too little to understand anything so we didn’t dress him up and he didn’t go trick or treating. But now that he is two years old, can’t stop talking and loves candies, we think it’s time for him to have some Halloween fun. He is going to be the pirate of the Neverland. His daycare has a big Halloween potluck tomorrow and everyone is going to bring a treat. I decided to bake these delicious banana cream cheese muffins for the kids in his class. I baked these muffins last week and as soon as they were out of the oven, I took a bite and decided that this is the item to bring to the party…banana plus cream cheese will be a surefire hit at the party. And perhaps Baby G will become even more popular now that the mom is out to bribe all his little friends with some really good muffins! These banana cream cheese muffin recipe is adapted from Baked Bree, whom I met earlier this month (I also met with Gina at Skinny Taste ). When I first spotted the recipe on Baked Bree, I immediately saved it. I know most people love banana nut muffin but imagine your regular version with cream cheese…they are the best combinations ever. I have just baked these banana cream cheese muffins again for tomorrow’s party and I am seriously having trouble not to eat them. They smell too good and tempting! In any case, this is a recipe that you should totally try out if you love muffins, or if you wish to feed your kids with some nutritious breakfast or afternoon snack. I guarantee that they will not stop eating. For more baking ideas, check out my baking recipes. Banana Cream Cheese Muffins – The sweetest and creamiest muffin recipe ever. It's like eating banana muffin and cheesecake together in one bite. Sieve the flour, baking soda, baking powder and fine salt into a bowl. Whisk to mix. Beat the butter, sugar and cream cheese until light and fluffy, about 3 minutes on medium speed. Turn the mixer to low and add the egg and vanilla extract. Mix until combined. Add the dry ingredients, one tablespoon at a time. Slowly beat in the mashed banana until all ingredients just combined. Do not over beat. In a separate bowl, mix all the ingredients for Cream Cheese Filling until smooth. Transfer 1 big tablespoon of the muffin batter into each muffin/cupcake liner. Form a well in the center of each liner. Add 1 big teaspoon of the Cream Cheese Filling into the well. Fill up each liner with more batter until approximately 3/4 full. Arrange a few walnut pieces on the top center. Bake for 25-30 minutes. Transfer to wire rack to cool completely before storing in an air tight container. I've omitted the cinnamon from the original recipe. 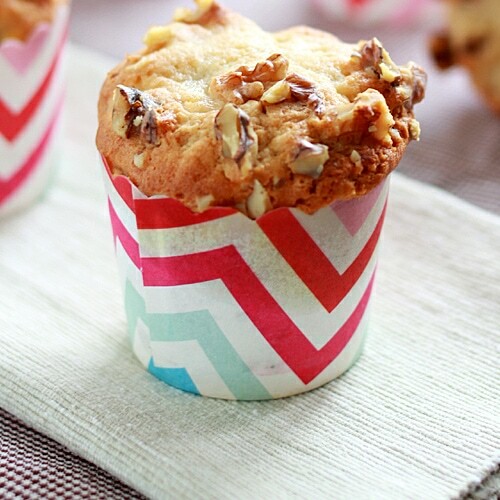 Use cupcake size liners and baking pan (12 cups in a pan) for this mini muffin recipe. Your banana cream cheese muffin looks so nice. I’m sure it’ll be a hit at the party. I put chopped dried fruit like apples, apricots and dates. NUTS!!! Different kinds of nuts esp pistachios! could I sub the bananas for apple sauce? You can try, but mashed banana and apple sauce may not have the similar consistency thus I am not sure the correct amount to use as substitute. Since these have a cream cheese filling, do they need to be refrigerated? 1-1/2cup flour, 1 cup sugar. Is the cream cheese the block type or the spreadable cheese. Thank you for your help. @Et: 1 cup of flour is approximately 125g (depending on humidity), 1.5 cup flour is ~187.5g. 1 cup of sugar is approximately 200g. We always use the block cream cheese for baking. Thank you for your quick response. Would appreciate if for future recipes you also indicate the grams besides the cup measurement so that I need not have to trouble you again with this conversion again. @Laura: I didn’t refrigerate, but they are so good that they will be gone within 1-2 days. Hi Bee, thank you for sharing this recipe. Banana and cream cheese are two of my best mix favourites. How time flies to see that Baby G has grown so fast – 2 years old. I can’t wait to try these yummy muffins for my kids. Thanks Lena. I know, they grow so fast and it was like yesterday when I posted that he was born. Thank you, Bee, for such a great muffin recipe! I had some bananas hanging around, and your recipe sounded so good that I made it last night. I did have to substitute some ingredients, though: chocolate cream cheese (Kraft Philadelphi Indulgence in milk chocolate) and cashews, broken into bits. They turned out fluffy and moist. Thanks again! Sounds delicious, I’m gonna try it… can I substitute the mashed bananas for Blackberry jam? I think so but I can’t guarantee the same results. Perhaps you can use mashed blackberries. This looks insanely good. I’m definitely going to try it! Where did you get those cute little cupcake liners? Hi Bee, Thanks for this wonderful recipe, I tried baking it twice, they tasted superb, but is not nice looking, it collapsed in the middle, must I used 12 cups baking pan? I used 6 cups baking pan and made 12 – 18 muffins. Thanks Malibu I am so happy you like my recipes. Hi bee. I try that today. After remove the muffin from oven, the muffin sink in the centre. Any idea, What went wrong?